http://chelseawinter.co.nz/greek-style-fish-salad/ Chelsea Winter is a star ! Another fabulous recipe that is easily put together with the thermomix but really you don’t even need one because it’s so simple and the flavours are so delicious. This has to be the freshest most tasty fish salad we’ve ever had. Made it for afternoon tea and dinner because we have a busy evening ahead with kids activities and concerts. Toasted some pita bread so the kids could fill with the salad. I couldn’t believe it when I saw Miss 8 eating the red onions and the olives by themselves (she’s never liked these before) and filling her pita bread to the brim. The hero of the dish is the feta herb dressing, blitzed a few seconds in TM bowl. Will be doubling the dressing next time. Lucky for us we have tons of oregano growing the the garden so we could chop and sprinkle fresh oregano onto the fish fillets. The sumac gives the fish a slightly lemony flavour and pan fried in butter, it’s just sublime. Steamed the potatoes in the Varoma, 20 minutes, varoma temp, speed 2 with 500g water in TM bowl. Didn’t have asparagus, used blanched beans instead. 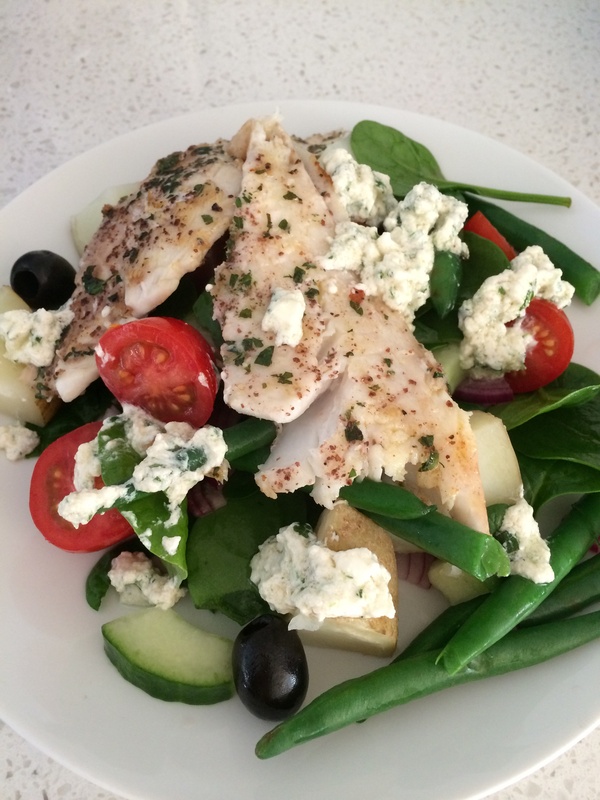 This will now be our number one favourite fish salad.